You either love or loathe meatloaf. It is good the first night, and even better as leftovers. I can remember growing up my Grandmother would serve up meatloaf sandwiches and they were amazing. Now meatloaf was ever exotic at my house, but here are some creative ways to serve up meatloaf. Do you ever search for the perfect meatloaf recipe? We all have our favorites. I personally like the one that sings, but I also like the kind that you eat. Meatloaf has long been a dish that people made everywhere to help stretch out meat. You can make it with beef, lamb, pork, turkey, or really any style of minced meat. I have gathered up several offerings for meatloaf. You will find them made out of a variety of meats. You can also find them in personal size as well as large family loaves. Some of these are more spicy than others, so you are certain to find a meatloaf recipe here that you will love. Boston Market Meatloaf – My readers favorite copycat recipe for meatloaf. Menlo Park’s Meatloaf – from the famous Menlo Park. Brown Sugar Meatloaf – this meatloaf has brown sugar in it for a special flavor. Homemade Classic Meatloaf – my personal take on the classic homemade meatloaf, featuring a ketchup glaze. Momma Joe’s Meatloaf – this easy meatloaf recipe shouldn’t be missed. Bacon Cheeseburger Meatloaf – do you love burgers? This one combines the best of burgers and what we love about meatloaf. Fooled You! Surprise its Meatloaf One delicious meatloaf made with Lipton Onion Soup mix. Slow Cooker Meatloaf – you can cook meatloaf in a slow cooker in about 5 hours. Italian Sausage Market Meatloaf – Italian sausage adds a very nice flavor to this classic dish. Turkey Veggie Meatloaf – want to try a lighter meatloaf? Turkey meatloaf is perfect for this. Skinnier Meatloaf with BBQ Smoke Glaze – this smokey version of this classic dish is a great variation. Mom’s Meatloaf – try this classic preparation. Mushroom Meatloaf – mushrooms add so much to meatloaf. Not Your Mother’s Meatloaf – try this special variation on this main dish. Turkey Meatloaf – another light version of recipe. All American Meatless Loaf – check out this lovely meatless, “meatloaf”. Grilled Planked Meatloaf – yes, you can grill this for a great flavor. Magnolia Days Meatloaf – This is a wonderful meatloaf that is just like your grandmother would make that is made with a flavorful sauce that is amazing. Chorizo Meatloaf with Chipotle Queso Sauce – I love this South of the boarder inspiration. BBQ Bacon Wrapped Meatloaf Peach Relish – bacon makes most things better, it makes this dish out of this world. Slow Cooker Meatloaf – love slow cookers? Try making your meatloaf in a slow cooker. Mini BBQ Meatloaves – this BBQ treat is perfect in the small size. Tex Mex Mini Loaves – these mini loaves are perfect, they are individual servings. Buffalo Chicken Meatloaf Cupcakes – tailgating inspiration makes fora great change. Italian Turkey Meatloaf Muffins – this is lighter and Italian inspired. Halloween Meatloaf Cupcakes – this is a fun way to enjoy this meal with your children. Grilled Meatloaf Sliders – enjoy your meatloaf when served as a sliders. Mini Cheddar BBQ Turkey Meatloaf Muffins – what is not to love? I love Mimi’s Cafe meatloaf! It tastes very beefy with no tomato taste at all! I cannot stand tomato produces in meatloaf and would love to have the recipe for Mimi’s. Can you help? I hear ya 😉 I will see what I can do about that one. I’m looking for a copycat Houlihan’s meatloaf recipe. Can you help? I don’t have anything on this yet, but I will keep this in mind! Mix with spoon, then knead by hand until well mixed. Fry small patty in pan to taste if seasoning is as desired, then place in glass loaf pan and bake at 350 for one hour. Thank you 😉 It sounds like a great meatloaf! I’m wondering how to replicate Stouffer’s meat loaf. It’s so light. I can tell it has onion in it. Is it extra egg? I made one with too much breadcrumbs, and its texture was just like a diner’s, so I know how they do theirs. I will have to give theirs a try. I haven’t tried it in recent memory. Stephanie, I might have posted a recipe request in the wrong place… My wife and I were looking for a copycat of Cotton Patch Cafe’s meatloaf. I’m afraid today that I will have to make a special trip 30 minutes into town to pick up a to-go order. We love meatloaf! Great round-up! Who doesn’t love a tasty meatloaf?? Thank you for a great meatloaf recipe to add to this collection! 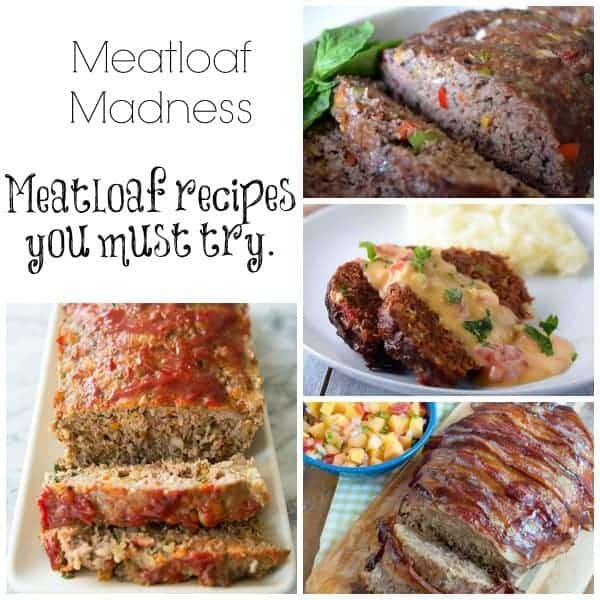 What a great collection of meatloaf recipes! Meatloaf has always been a favorite of our family so I’m happy to have some new ones to try. Thanks so much for including my bacon wrapped version. So happy to include terrific recipes. Great idea, I will see what I can do.